The birth of what we know of as Moulin Tacussel in the Southern Rhone Valley today came from the Tacussel family. The Tacussel family were also responsible for founding Clos Saint Jean. At the time the estate was created, it was simply known as Domaine Tacussel. That all changed in 1976 when the vineyard was sold by Henri Tacussel to Robert Moulin in 1976. Robert Moulin added his name to the property and Domaine Moulin Tacussel was born. However, it took almost a decade before the new owner began to produce, bottle and sell their own wine. The debut vintage for Moulin Tacussel came with the 1985 vintage. Domaine Moulin Tacussel owns 7.85 hectares of vines in the Chateauneuf du Pape appellation. 7.25 hectares are planted to red wine grape varieties and .6 hectares are used for white wine grapes. On average, the vines are close to 45 years of age. However, they have a small parcel of vines that are more than 110 years old, which was planted back in 1904. 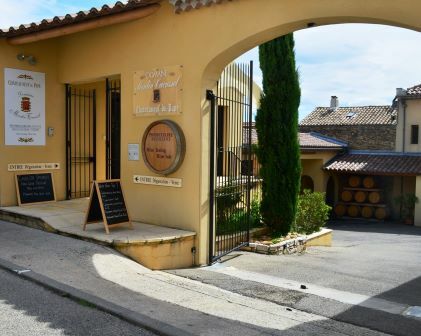 Domaine Moulin Tacussel produces 2 red Chateauneuf du Pape wines and one white Chateauneuf du Pape wine. Domaine Moulin Tacussel Chateauneuf du Pape is a blend of 75% Grenache, 10% Mourvedre, 10% Syrah and 5% assorted varieties that include Cinsault, Counoise, Muscardin and Vaccarese. The terroir is rocks, stones, sand and limestone soil. The vines are planted in the Colombis, Mont Pertuis, Mourre de Gaud and le Palestor lieux-dits. The wine is aged in a combination of foudres, tank and used French oak barrels for 12-14 months before bottling. The production is on average 1,000 cases. Domaine Moulin Tacussel Hommage a Henry Tacussel is most often a blend of almost 100% old vine Grenache and a small portion of Syrah that averages less than 5% of the blend. The terroir is mostly sandy soil in the Palestor lieu-dit. The wine is aged in demi-muids for 13 months before bottling. The production is quite small with about 100 cases of wine being produced in each vintage. In 2012 Domaine Moulin Tacussel produced a Vieilles Vignes bottling made from 100% old vine Grenache planted in the Charbonnieres lieu-dit. The wine was aged in foudres for 12 months before bottling. Domaine Moulin Tacussel Chateauneuf du Pape Blanc is a blend of 30% Grenache Blanc, 30% Roussanne, 20% Clairette, 12% Bourboulenc and 8% Picpoul. The wine is aged in new and used, French oak barrels for 6 months prior to bottling. Domaine Moulin Tacussel can be enjoyed on the young side with about 1 hour of decanting. This allows the wine to soften and open its perfume. Older vintages might need very little decanting, just enough to remove the sediment. Domaine Moulin Tacussel is usually better with 2-4 years of bottle age. Of course that can vary slightly, depending on the vintage. In the best vintages the wine should be consumed within 3-12 years after the vintage. Domaine Moulin Tacussel is best served at 15.5 degrees Celsius, 60 degrees Fahrenheit. The cool, almost cellar temperature gives the wine more freshness and lift. Domaine Moulin Tacussel is best served with all types of classic meat dishes, veal, pork, beef, lamb, duck, game, roast chicken, roasted, braised, stewed, grilled dishes, sausage, barbecue and cassoulet. Domaine Moulin Tacussel is also good with Asian dishes, hearty fish courses like tuna, mushrooms, cheese, pasta, eggplant and tomatoes. The white wine of Domaine Moulin Tacussel is best served with a myriad of different seafood dishes, shellfish, crab, lobster, sushi, sashimi, chicken, pork and veal, as well as Asian cuisine. Lush, rich, plush, ripe, concentrated and loaded with sweet, juicy plums, kirsch, black cherries, licorice and spice. The wine has flesh, complexity and vibrancy. It is an engaging wine to drink. The wine is made using 100% old, vine Grenache. Medium bodied, floral and fresh, the wine is all about its ripe, bright, red fruits and elegant stylings. The wine was produced from 70% Grenache blended with various, assorted, AOC allowed varietals. Fresh, lively, medium bodied, soft textured and with a nice blend of cherry and garrigue that you find from start to finish here. The wine is made using only 100% old, vine Grenache. Forward, and spicy, medium bodied, fresh and with an up-font meaty, peppery, kirsch tinged charm, you can enjoy this on release. The wine was produced from 70% Grenache and was blended with various, assorted, AOC allowed varietals. Light, fresh, easy drinking, forward, spicy, kirsch and red berry filled wine with a nice pepper driven component in the bright finish. Fresh fruits, ripe tannins and loads of soft, clean red fruits, herbs and silky textures are all over the place in this charmer. Spicy black cherries and a distinctive tapenade note mesh well with the medium body and crisp freshness in the finish. Medium bodied, soft, refined, and easy to drink, the ripe cherries are fresh, sweet and bright. The added notes of olives, licorice and herbs with background spicy nuances make it even more interesting to imbibe. Better on the nose than the palate, with its spicy, melon nose. The wine is light, short and there is a touch of heat in the finish. I'd drink this white Chateauneuf du Pape blend of 40% Roussanne, 30% Grenache Blanc, 10% Clairette, 10% Picpoul over the next year or two. Medium bodied, soft, silky and on the elegant side of the style range, with its fresh kirsch and strawberry fruit quality. This is drinking nicely today, which is a good thing as I doubt this is going to make old bones.